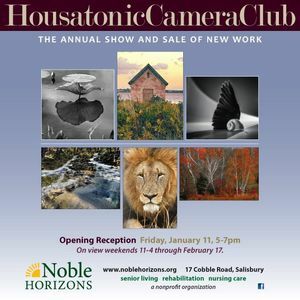 On Friday, January 11 from 5 to 7 p.m., Noble Horizons will host an opening reception for the Housatonic Camera Club’s exhibit of new works. The Housatonic Camera Club (HCC) includes members from tri-state area communities (Connecticut, Massachusetts, and New York) and offers a variety of programs to the general public, including workshops and classes for beginners to experts. The exhibit will be open weekends 111 a.m. to 4 p.m. through February 17. Noble Horizons is located at 17 Cobble Road in Salisbury, CT; more information is available at 860-435-9851 or www.noblehorizons.org.